Heat Shrink Film Window Insulation Weatherization Kit gives you the benefits of an insulated window without the expense of retrofitting insulation and replacing drafty windows. 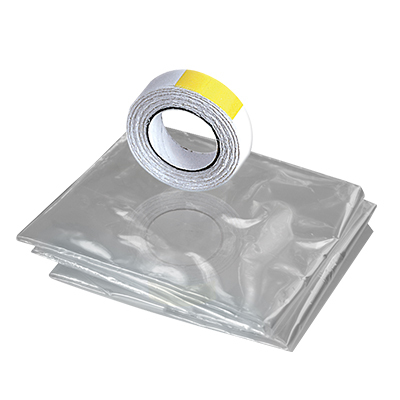 This popular, easy-to-use Heat Shrink Film Window Insulation Weatherization Kit, contains plastic shrink film and two-way tape to insulate and weatherize average size windows. Seals windows airtight, eliminates condensation, cold drafts, and heat loss. Tape securely holds the plastic film used in the Heat Shrink Film Window Insulation Weatherization Kit in place. Hair dryer shrinks plastic film to form smooth, tight, clear-as-glass inside storm window that insulates. AM Conservation Group specializes in weatherization products which promote energy conservation and energy efficiency.